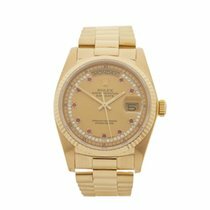 This is a pre-owned Rolex Day-Date 36 men's 18038 watch. 36mm case size in 18k yellow gold, champagne diamond markers dial on a 18k yellow gold president bracelet, powered by an automatic movement. This Rolex is in excellent condition complete with box only. Circa 1981. Our Xupes reference is W5745 should you need to quote this.